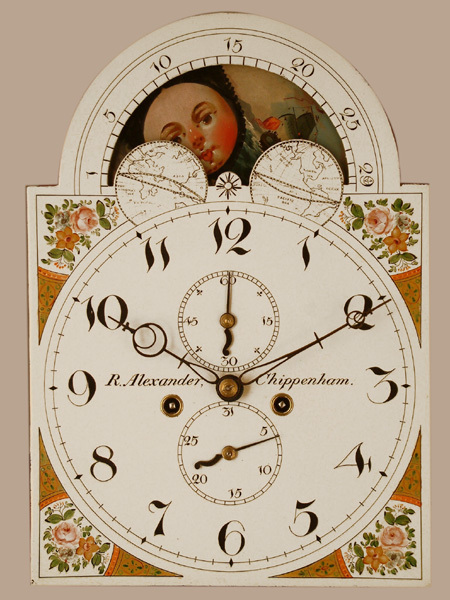 This Longcase Mahogany Archive's Maker - R. ( Richard ) Alexander of Chippenham. Two such - father and son.Father born 1757 died 1838, son born 1787 died1852. Small, well proportioned, highly figured, mahogany case of good rich colour and patination. Swan neck pediment with central eagle/ball finial.Typical westcountry features of boxwood strung canted corners to trunk and "wavy" inside edge to hood door.Details include boxwood stringing, mahogany crossbanding, inlaid stringing, ebonised fluted hood columns and trunk door edges. Case delivery instructions in faded wax crayon "Mr. Alexander Clock and Watchmaker Chippenham" to lower back of case. 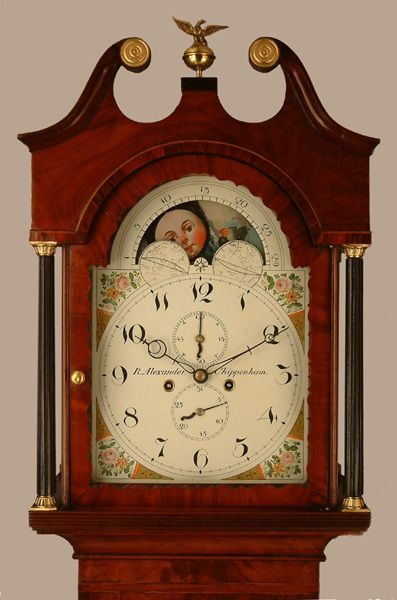 12" breakarch painted dial with moonphases to arch, subsidiary dials for seconds and date, flower painted corner spandrels, "wavy" Arabic numerals and blued cut steel hands.Dial maker Foster of Birmingham recorded in Suffolk St.1810 -20. Good quality 8 day movement with hourly ( rack ) striking on a single bell. R. ( Richard ) Alexander of Chippenham. Two such - father and son.Father born 1757 died 1838, son born 1787 died1852. 81.5" ( 207cms. ) or 80" ( 203 cms. ) ex. finial.